Picked up my first Glock ever - a G42 , last Nov. off the classifieds here and aside from the gun having malfunctions with Federal 95 FMJ ammo I am really pleased with it. It fits my hand very well and is equipped with the easiest to see sights of all my defensive pistols. Here are few recent results at the range - the left is 20 shots @ 7 yards with Remington 95 FMJ and the right a week later is 10 shots at 15 yards with the same ammo. I did move the sight over before the 15 yard target. If I had any other gripe it would be the trigger is not near the advertised 5.5lbs. I am going to load up some of my 90 grain Hornady XTP loads and may even try some 25 yard targets next time. 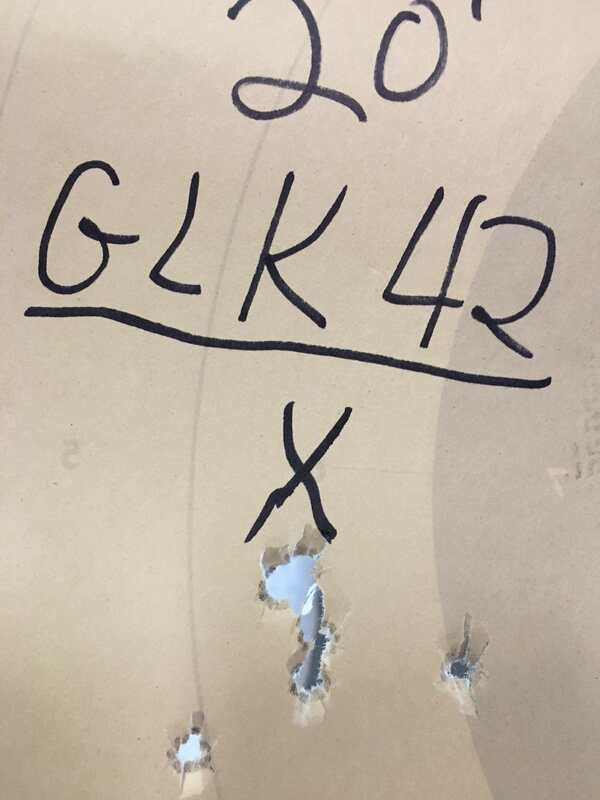 When I had a G42 (which shot better in my hands than the G43), this is what I found at 20'. Shooting a little low of the X I drew on on old target. I'm big fan of the G42, my friend has one with a couple thousand rounds through it's a great pistol. I carry my G42 daily and shoot it in the Pocket Glock class in GSSF. It has a little over 2300 rounds through it and has been an awesome gun. The only malfs I have had were some shooter induced slide locks on a loaded mag when shooting with both thumbs forward, and it will jam occasionally if it gets really dirty. I now shoot this particular pistol old school with my strong hand thumb tucked under my support hand thumb. I also field strip it, wipe it down, and lube it regularly now. I loaned mine to an in law from Kentucky in November, and just got it back. I took it to the range and slammed it, all fifty FMJ down range, forty four in the red, three in the head, three left missing the red, grrrr that last mag of six was the one I put thee in the head, and towards the red.